In the previous post we have set up the football ground and we are all set to shoot and save the penalties. In this part of this tutorial series, we will add shooting capabilities to both the player and the opponent. Note that you need Unity Remote to test this post. 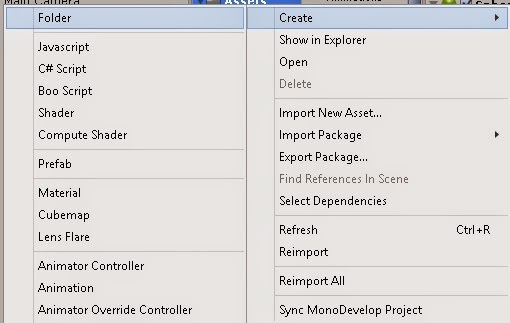 To get started with this, we need to create a new C# script named SwipeControl. But before that just for the sake of neatness, we will create a New Folder and name it as Scripts under the Assets folder. Place the SwipeControl script in this folder. Attach the C# script to the Football gameobject. Double click on the script to open it so that we can start adding some logic to it. Now those are one heck of a variables. Aren't they? But hey! We need them! - The Time.timeScale is set to 1 on start as will set it to 0 once the game is over so as to stop the world. 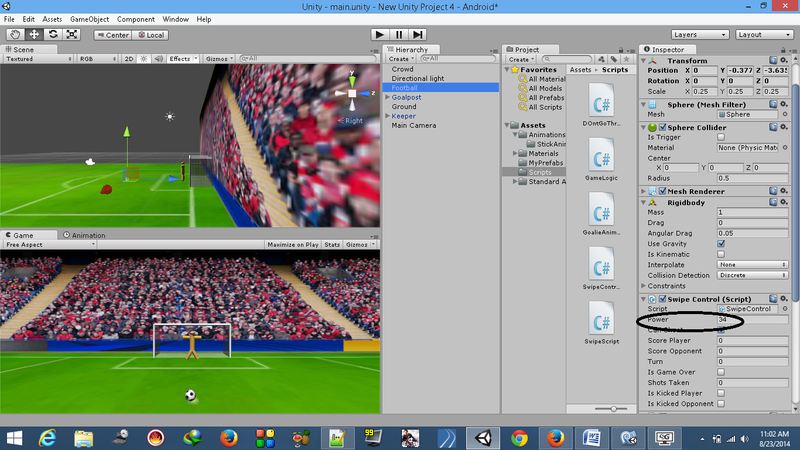 - The player needs to swipe for a minimum distance of 20% of the phone screen if the is to shoot the football. - The initial position of the football is stored to reposition it after every shot is taken. The Update function is where most of the logic will be involved so we will create functions which will be called from it so as to make it more readable. Now that was pretty simple, eh! But then, the whole logic is pending. Phew! Am I not tired of typing? Now the above function looks very long and complex. But trust me, it is not. As we know that if turn is 0, we are supposed to be the striker and if it is 1, the opponent is the striker and we, the goalie. Hence, the above function is called whenever turn is 0. We basically check for genuine swipe here in the above function and also the swipe direction. Based on the swipe direction, we add force to the football in that respective direction. The foreach loop can be removed if you do not want to detect more than one swipe. We catch hold of the first touch position when the swipe has begun. Meanwhile, the last touch is caught hold of in the end phase of the touch. Further, we check for the genuine swipe in the line 15. If it is a swipe, we dig on further to check the direction of the drag, videlicet, horizontal or vertical. Once the direction is determined, we check if the swipe is left or right (horizontal), up or down for Vertical. We have divided by the Screen.height so the force added will not be Screen size dependent. To make it clear, the force added and the direction in which the ball is shot is the same regardless of what screen sized phone you play this game in. For the Vertical swipe and the diagonal swipes, we need to determine the x and y values from the swipe itself. I have assigned the z value as a constant value (15) as the swipe on the screen is a 2D and you won't get a z axis value from it. The x and y values are calculated based on the swipe distance, more the swipe distance, more the force. Once these are set, we call a Coroutine to add some delay before the ball is returned to its initial position. The above function detects a tap on the screen and shoots the ball based on the force added in the DelayAdd function. The delay is added so as to give some time to the player to guess the direction in which the ball is shot. Feel free to modify the delay and the random value ranges of x and y to your needs. Note that the Force mode her is impulse, as we want it to be a short burst of force. Set the value of Power in the Inspector to 34. Well, there are many ways to do it. Its not simple though. Either you can use Bezier curves to add a curl to the ball or you can simple apply a impulse force along the x axis in FixedUpdate so that the ball curls... Both can be equally effective, as I said, it's how you detect the curved swipe and add the curl to the ball. MissingComponentException: There is no 'Rigidbody' attached to the "Football" game object, but a script is trying to access it. You probably need to add a Rigidbody to the game object "Football". Or your script needs to check if the component is attached before using it. Hey, Thanks a lot for the help, it works now! HI very nice tutorial. What if i only want to addforce once? and not constantly so that after some time object stops. You can use the ForceMode.Impulse to add a force once... Check out the unity doc for more info.. So far so good, im making a project like this, but working in unity 5. Everything works, only some changes in the API of the way to access to the components of a game object. i want to add force on curved swipe. i mean, if i give a curved swipe as input, ball should travel a on a swinged path according to curve of swipe instead of goung in a straight direction. what to add next in it? Hello I hope you can answer me. I have a question, its regarding this post. When I play the scene the ball never moves. I don't know why. Could you help me? Thanks and good post btw. hi there did u figure out the problem? i am having the same problem. I am unable to shoot the ball in the editor, but I can in the mobile. Why is that ? Also the ball moves very slowly. How can I speed it up ? its doesnt work on unity 2018? When I choose resolution. Camara not fix. Please help me! i wanna make it for PC what do i need to do?